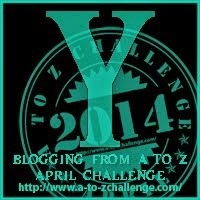 Can you believe it, the month long A to Z Blogging Challenge is almost over! While it has been fun...and challenging, it will be fun to get back to my normal blogging fare; for me anyway! I chose You for the Letter Y because I am so thankful for all of You, my readers! You have been so patient to stay with me throughout this month of eclectic posts. I have so enjoyed all the comments...keep them coming! Thank you for visiting today and everyday! Kathy, I really have enjoyed your journey and hope you know we all loved learning about you! Thank you so much Cary! I have been enjoying your comments! You've done well with this. Congratulations on being in the home stretch! Thanks, William! All finished...till next year now:) What a challenge it is but great for the writing!